Police from all over the country stood outside the church Wednesday. 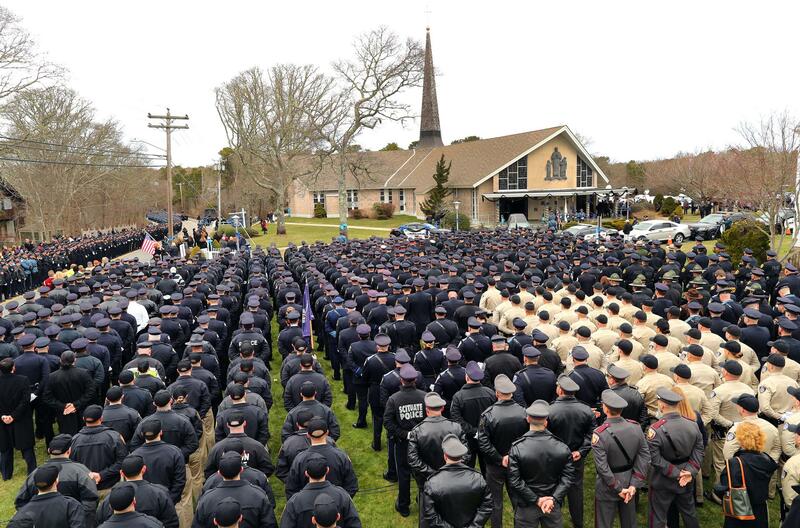 YARMOUTH — As church bells tolled, row after row of police officers snapped to attention and saluted in tribute, thousands of white gloves rising as one. 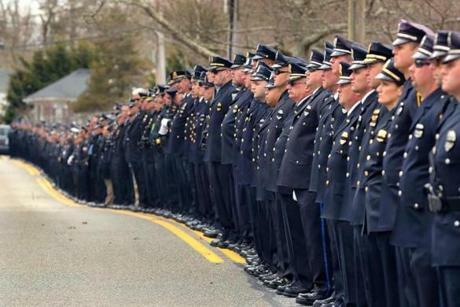 They had come from far and near for the funeral of Yarmouth police Sergeant Sean M. Gannon, a 32-year-old killed in the line of duty last week. 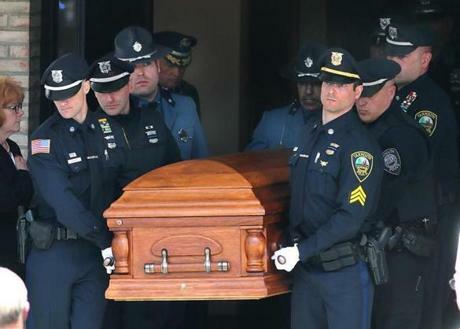 As the hearse carrying his body passed by, a few officers cried out softly. But no one moved. “We come together and mourn his death, but we also give thanks that he lived, that we knew him on some level — although we feel empty, feel grief,” he said. For Christians, the holy season of Easter is “a time of hope and time of joy,” Caron said. “Sean was both of these things,” he said. The church was filled with Gannon’s immediate family, friends, and fellow police officers wearing dress uniforms, their badges crossed with a dark band symbolizing a death in the line of duty. Gannon is the 38th law enforcement officer to die on duty this year, according to the National Law Enforcement Officers Memorial Fund. Yarmouth police officers helped carry the casket out after the service. Gannon, who had worked for the Yarmouth Police Department for eight years, was fatally shot last week while he tried to arrest Thomas M. Latanowich on a probation violation warrant in Barnstable, authorities say. Latanowich, 29, has been charged with murder and is being held without bail. Before the service, Ann Bertolino stood on her tiptoes, straining to catch a glimpse of Gannon’s family as they entered the church. Bertolino lives directly behind the house where Gannon was shot. 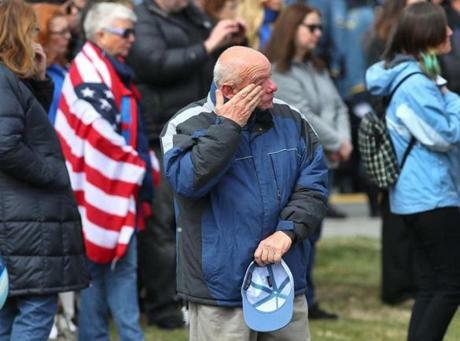 Among those gathered near the church was Mary Gaughan, who was holding a photograph of her brother-in-law, Steven F. Gaughan, a police officer in Maryland who was shot and killed in 2005 while chasing armed robbery suspects. She didn’t know Gannon, but felt obliged to honor his sacrifice. Kevin Kenney from Dennis cried as he stood in front of the church watching the funeral procession. Latanowich, is a career criminal who spent four years in state prison after pleading guilty to drug and gun charges, authorities say. On social media, Yarmouth police has identified Latanowich only as “125,” the total number of entries on his criminal history. His long record has sparked outrage and disbelief that he had been allowed to remain free. Gannon graduated from Bishop Stang High School in Dartmouth in 2003 and received a bachelor’s degree in criminal justice from Westfield State University in 2007. Before joining the Yarmouth force, Gannon worked for three years with the Stonehill College campus police. Police from all over the country lined the street outside the church. On Wednesday, Gannon was posthumously promoted to the rank of sergeant by his department. He leaves his wife, Dara, and many other family members, including his parents, Denise and Patrick. Gannon had volunteered with the Big Brothers and Big Sisters of Cape Cod and the Islands for three years, and often encouraged other officers to help the program. 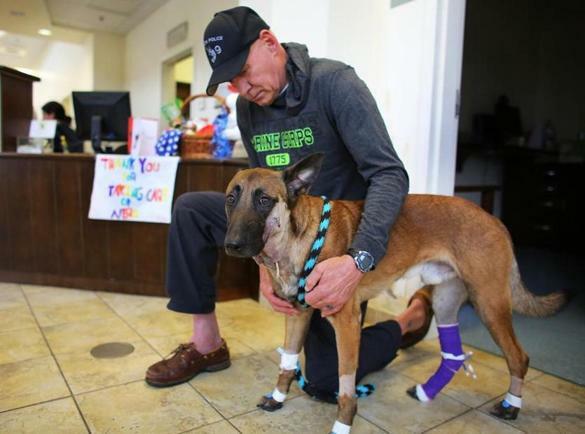 A popular figure in the community, Gannon sometimes brought along his police dog, Nero. 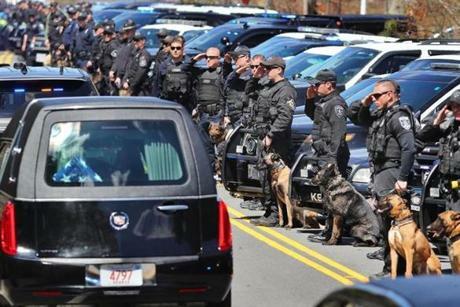 Hundreds of K-9 officers lined the road as the funeral procession made its way past the Yarmouth police station. Gannon’s “little brother” in the program, who deeply admired Gannon and aspired to follow in his footsteps and become a police officer, is devastated by his death, Mell said. In his absence, other Yarmouth police officers have stepped in help the boy. As the hearse carried Gannon’s body to its final resting place, officers turned away from their spots and marched down the street. Down the road, up a hill, and through intersections, they marched on. 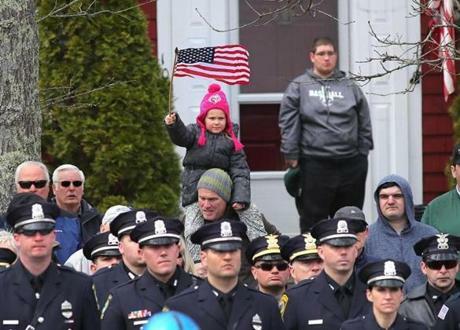 A young girl waved a flag in a yard behind police officers who lined the street in front of the church.